One of Washington State’s most coveted wild places – the Enchantments, located in the Alpine Lakes Wilderness – could be impacted by a wide-ranging water management proposal called the Icicle Creek Strategy. The plan, which was introduced by Chelan County and the Washington State Department of Ecology, calls for new, enlarged dams, which could flood nearby trails and campsites. It also raises concerns about appropriate actions in a protected wilderness area. 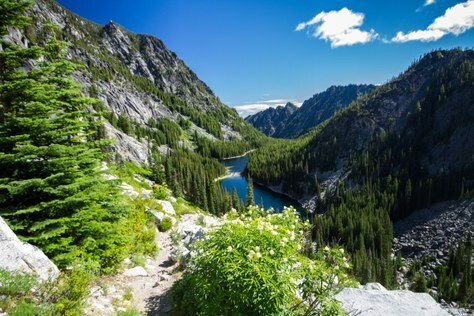 As countless Mountaineers know, The Enchantments is home to pristine alpine lakes and towering peaks – a prime destination for hiking, backpacking, and climbing. We encourage you to learn more about the proposal and use the public comment period to make your voice heard. We’ve taken a close look at how the plan would affect outdoor enthusiasts and highlighted some of our concerns below. Thank you to Washington Trails Association for their partnership on this issue. Together, we are submitting comments on the proposal to the Chelan County Natural Resources Department. You have through July 30th to submit comments. The strategy calls for new, larger dams and water diversions. These proposals would be unprecedented actions in the Alpine Lakes Wilderness areas. Here at The Mountaineers, we believe designated Wilderness is a core tool in protecting the outdoor experience. Wilderness areas include some of our most beloved areas for hiking, climbing, scrambling, and backcountry skiing. The designation protects the wildlife habitat that makes our outdoor adventures so special. While we understand the need for more water for fish, homes, and agriculture in the greater Leavenworth area, the Icicle Strategy contains projects that would have lasting negative impacts on the wilderness and outdoor enthusiasts. Increasing the size of the dam on Eightmile Lake, which could flood the Eightmile Lake trail and some campsites around the lake. Increasing the size of the dams on Upper and Lower Snow Lakes, which would raise the level of the lakes and will likely flood the trail and campsites around the lake. Boring a tunnel from Upper to Lower Klonaqua Lakes, which would likely have significant negative impacts to the land surrounding the lakes. The Mountaineers supports the sections of the strategy pertaining to habitat protection and enhancement projects, fish passage, fish screening, and water conservation efficiencies. We wholeheartedly believe that these conservation elements are foundational to the outdoor experience and in protecting these landscapes.